A few of my friends, just talking. In early May this year, I saw some old friends for the first time face -to-face. We sat around tables at the top of the Summit in Chicago. We were supposed to be talking about how to become better bloggers. But we were all amused and amazed to be in the same geography, talking in real time. Though we had never seen each other, we started talking in the middle of the conversation. We had been enmeshed in conversations for a long time. I had worked on a fabulous podcast Becky McCray created. I had contributed to Joanna Young‘s wonderful writing blog. Thomas Knoll worked with me on a group Lent blog. Chris Cree and I had written to each other. I had contributed to Robert Hruzek‘s great “What I learned from” series. And now we saw each other at Liz’s place. This kind of conversation that starts and grows and deepens long before you meet face-to-face is at the heart of a new book about conversation. 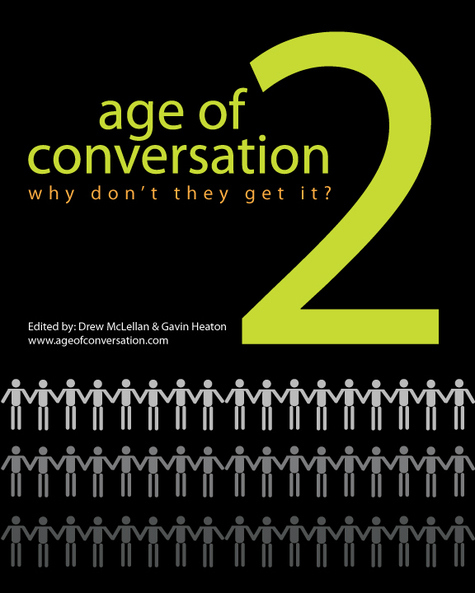 Today marks the publication of the Age of Conversation 2, one book with 237 authors. I’m one of the authors who contributed four hundred words. And so are the people I met in May. And so are Connie Reece, who was part of the same Lent blog and Cathleen Rittereiser who I met in NYC last year and lots of other people I haven’t met yet. The book will be available for purchase here starting at 8:00am today (Wednesday). 100% of profits will be donated to Variety, the Children’s Charity. (We all agreed to that.) You can buy it in downloadable e-book ($12.50), softcover ($19.95) and hardcover ($29.95). The e-book sends the most to Variety. Here’s an important note. I don’t know whether I agree with everything my co-authors wrote. Some of them will disagree with me. But that’s what conversation is about. I’ll write more about what’s in the book when I actually get my copy. Today. And then the conversation will continue. Here are all of the writers who are part of this project. This entry was posted in just musing and tagged age of conversation, AOC2. Bookmark the permalink. Jon, thanks for getting the word out about AOC2. You describe perfectly the magic that these intense type of projects creates. I can’t wait for my copy.